With its sixth season coming to a climactic close, Game of Thrones remains one of the most popular series to date, especially given its large following both within the television world and the literary world. While other shows like Breaking Bad or Mad Men are equally as successful as well as creative, the fanbase in Game of Thrones is oftentimes unique to fantasy or science fiction genres because there is so much world to be discovered and learned about. This is also the case for the two other big fantasy series, Lord of the Rings and Harry Potter, which got me wondering if either series could be adapted for television. As you may gather from the title, after some thought, I have decided neither would work for television and believe my reasoning could be fruitful to understanding what makes your story good for television versus film, should you decide your story would be best suited for either of those in the first place. Before I say anything further, I will assure those who are either reading the books or watching the series that I intend for the most part to avoid spoilers, though I will refer to characters and plot lines for the sake of examples, but only the most major ones that can be gathered from the pilot of the series. Additionally, while I am arguing by way of adaptation, I wholeheartedly believe these same practices can be executed in original works. One of the most common misconceptions about TV versus film is the comparison that film is now like a short story or novel, whereas TV is like a longer series or a chapter book. It is easy to see why this comparison is made, especially because Game of Thrones is a book series with many chapters developed into a television show. But if that's the case, then both Lord of the Rings and Harry Potter would be able to flourish as a TV series without a problem, and that is simply not the case. The real differentiator between TV and film is the notion that if a TV show were successful, it would be able to continue forever if need be. This obviously does not mean the show will last forever, but that it has the ability to. On the other hand, films have definite endings and so do books and short stories. Even large book series like A Son of Ice and Fire and of the Wheel of Time are written by the author with the idea that there is to be a grand arc of some sort. Sure there may be epilogs or spin-off series, but this is not the same as writing something that could exist forever. Television is not written that way for several reasons, the primary one being that for screenwriters it is a complete waste of energy to write out an entire series. They may write an outline of what happens, but usually no more than that. Instead, they write a pilot that sets up some problems and themes and send it out to executives hoping someone will pick it up. And if someone doesn't, they move on and shelf the project for a later day. However, if a show is picked up, writers - oftentimes not even those who wrote the original pilot - will decide on an episode-by-episode basis what will happen. They may map out how things will go a few episodes forward, but given how often shows are canceled, most television writers stick to one season at a time. 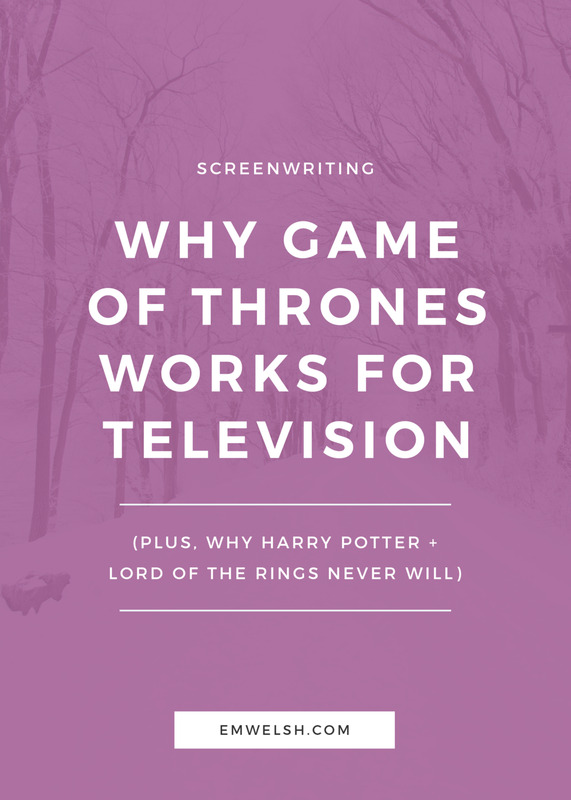 As a result, in order to avoid writing themselves into a corner, TV shows must be written so that the central conflicts and themes within them could be sustained forever, even when characters die and conditions change. Of course, there are exceptions, especially in mini-series like True Detective or American Horror Story, but these forms of television are not what I am discussing. A mini-series is actually quite like a book because it does have a definite arc and defined ending and tells things in a predetermined amount of episodes, demonstrating how Lord of the Rings and Harry Potter could quite easily exist in the mini-series form. However, given these conditions I have mentioned, one can better understand by way of example how Game of Thrones works so well for a traditional television series when the other two fantasy stories could not. In terms of adaptation, there is no disputing the vast amount of information that George R.R. Martin supplies the show writers of Game of Thrones. As it is, many loyal fans of the books have become disappointed over time because the writers are forced to leave information out now because there is almost too much to keep track of. Because of all the material given, Game of Thrones works wonderfully in keeping viewers entertained whilst the show remains relevant and still holds to its main themes and franchise, something I do not think is possible for the other two series. Of course, there is no doubt in my mind that if Tolkien were alive today and interested in TV writing, he would easily be able to supply ample information, backstories and subplots to fulfill an entire TV series. As for Rowling, she arguably already has enough information to sustain a seven or eight season series, though she too would have to add more subplots and side characters to meet the weekly sixty minute mark, especially with the first few books that are shorter in length. However, given the way the series were written and the nature of their central conflicts - which I will discuss shortly in a later section - it still remains impossible to adapt these books into a TV series without changing the nature of the initial work or making up new characters and backstories completely. As viewers, we never find it weird getting the Lannister perspective or Targaryen perspective, but it might feel strange and out of character from the books to suddenly get Cho Chang's perspective or even Bill Weaseley's. It's not to say that this is not desired from readers, but that if one were to try and adapt either Lord of the Rings or Harry Potter, there would only be one or two main characters to follow, tying back to my point about quantity. This is not to say that single main character stories don't work. Look at everything from The Sopranos to Mad Men, shows that have defined television drama as we know it. However, with many characters, there is more room for conflict and longevity, thereofore, more room for the show to continue on even when big characters die or leave the show for one reason or another. While the other things I've mentioned could easily be worked into a TV series if so desired, the overall central conflict of Game of Thrones was made for television. By that I mean, it was made to last forever if need be. Multiple characters and material quantity are not always necessary, and though I do think they add quite a bit to Game of Thrones, there have been series created with less that still do really well. However, even shows that have one main character or fewer subplots still have one thing in common with Game of Thrones - a conflict that can last forever. The conflicts within Game of Thrones are numerous, but the main ones include determining who should rule the realm and how to cope with the woes of nature - even the unnatural nature. Both of these conflicts can exist forever in a series because they already do exist in our own world without an end in sight. We as humans are constantly warring over who we believe should be the best leader and there is never a point where everybody is satisfied. The multiple main characters only enhance this conflict by exposing the various viewpoints people take on. As for nature, humans are always at war with it, trying to understand it and always being taken by surprise even when they feel prepared. One cannot ever expect to resolve the conflicts of nature completely because it is so unpredictable, demonstrating yet another conflict that mimics our own world's predicament. Harry Potter and Lord of the Rings however, have far less everlasting problems. Both involve taking down an evil force so that then the conflict and therefore the story are resolved and finished. One could argue that there is always someone who could take the place of whomever they most recently defeated, but that's not how these books are told and I am arguing purely based off the original text. Additionally, the problem - for television - lies in the fact that the opponents are so huge and seemingly invincible, that anything after would pale in comparison. If you are still confused, think of it this way - Harry Potter and Lord of the Rings are about taking down an evil force like Hitler, whereas Game of Thrones is about society's decisions on people like Hitler and who should take his place. It is not to say that because of this, either Harry Potter or Lord of the Rings lack quality - both are absolutely fantastic and the latter is a major influence on Game of Thrones - but instead that the classic story structure they adhere to is not suited for television. Deciding what format to put your story in is already difficult enough, however knowing why the greats have been adapted to certain forms can help you better understand what direction to take your own work. If you have an epic fantasy novel that follows the Hero's Journey, you can likely discern now that this would work far better for a film or film series than it would for television. Whereas if you want to write a British piece about the evolution of technology and how people adapt you might instead opt for TV. No matter what, at the core of this decision process, lies in conflict. If you write a story with many main characters or lots of details, it may still be a piece meant for film that you'll need to cut down or it may just be the icing on the cake that hooks viewers to your show. Either way, it's about finding what will best suit your story, even if that sometimes means writing a 100 page feature film only to find out you should be writing a TV series. Believe me, you wouldn't be the first to find out that way. Need help deciding whether your conflict is for film or television? Or maybe you disagree with what I'm saying completely? Be sure to comment and tell me why! And look out for future posts on television writing, ranging from how to write a pilot to how to find your theme for your show. Do You Have a Main Character or Protagonist?